What can we infer about Google’s technology, politics and business from observing its approach to mapping Crimea, a few weeks after the invasion and subsequent annexation of the region by Russia? Technology: We’ve long known Google has the ability to serve different mapping datasets to different Google top-level domain properties. For example, different-language versions of Google Maps will show you different toponyms. However, some local versions of Maps also differ in their boundaries: In China, ditu.google.cn shows Arunachal Pradesh as being Chinese, rather than disputed; in India, maps.google.co.in shows Aksai Chin as being Indian, rather than disputed. And in South Korea, maps.google.kr prevents you from zooming in on satellite imagery. For each of these locations, however, the default international maps.google.com defaults to a accurate, uncensored reference map — where the borders are shown as disputed, and where you can zoom in on the satellite imagery as much as you like. Now we have evidence of yet two more examples where localized Google Maps differ from the global reference version in their boundaries — in Crimea, for Russian Google Maps but also, surprisingly, for Ukrainian Google Maps. 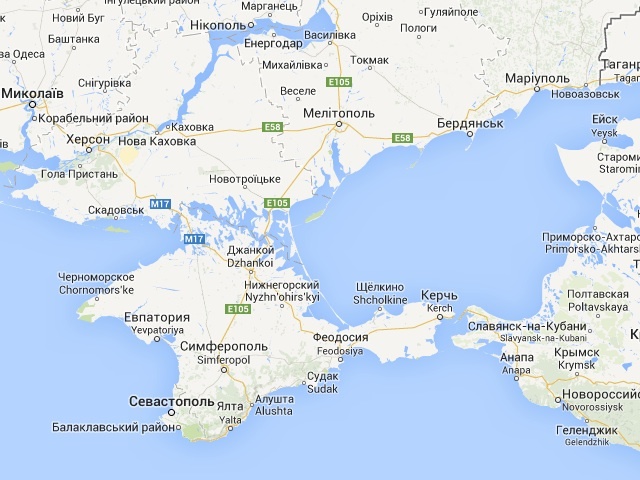 Russian Google Maps: The new border between Russia and Ukraine puts Crimea inside Russia. No dispute is indicated. 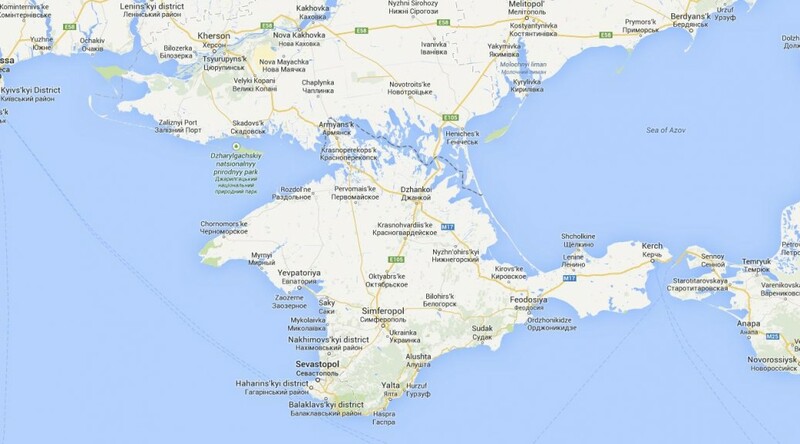 Ukrainian Google Maps: Crimea is part of Ukraine. The line defining Crimea light gray and dashed; it is the same kind of line demarcating other Ukrainian oblasts. No dispute is indicated. Politics: In every documented case until now — in China, in India and in South Korea — Google’s explanation for showing a dataset that diverges from the reference map has been that is is obliged to observe local laws, and in the case of China and India, local laws dictate that locally-published maps (including Internet maps) must show borders drawn a certain way. For South Korea, the dispute with North Korea legally precludes showing high-resolution imagery. Why does Google do this? Because it has a local presence — perhaps a sales office, or a development team — and so can be held accountable in local courts of law. In countries where Google does not have a presence, it does not care whether it observes local laws — look no further than North Korea, where the recent addition of concentration camps to the default layer of Google Maps is unlikely to pass local legal tests. Equally interesting, however, is that in countries where Google has a presence, but where there are no local laws mandating how maps shows national borders, Google has until now not adulterated its maps, because it is not legally obliged to do so. A fantastic case in point is the border between Thailand and Cambodia, most of which is in dispute. Both Thai Google Maps and Cambodian Google Maps show the two conflicting border claims side by side, in both datasets — a wonderful example of how more context on a map is always a good thing. It is worth noting that in all cases where Google does show tainted maps, these are only shown locally. None of these defects bleed into the international map dataset shown to the rest of us. Meanwhile, citizens of India, China and South Korea who choose to type maps.google.com into their browser will always get an accurate map. 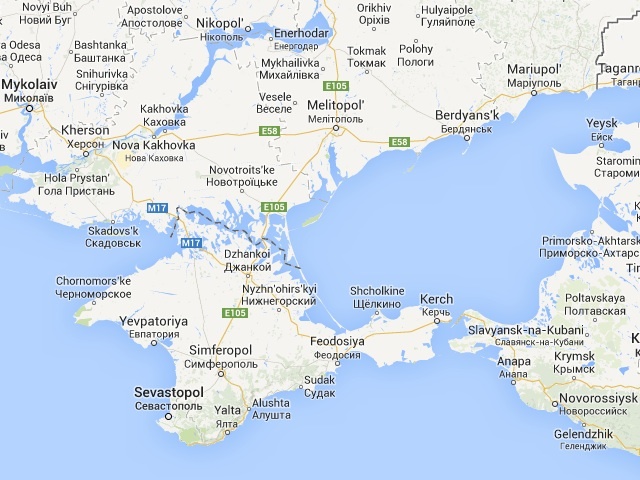 Business: So why does Google show Crimea as part of Russia to the Russians, and as part of Ukraine to the Ukrainians? “The Google Maps team is doing its best to objectively mark disputed regions and landmarks. In relevant cases the borders of disputed areas are marked in a special way. In countries where we have a localized version of our service, we follow local laws on representing borders and use of landmark names,” Svetlana Anurova of Google Russia told ITAR-TASS. Everyone shall be guaranteed the freedom of ideas and speech. […] No one may be forced to express his views and convictions or to reject them. […] Everyone shall have the right to freely look for, receive, transmit, produce and distribute information by any legal way. […] The freedom of mass communication shall be guaranteed. Censorship shall be banned. So on what possible grounds could Google argue that it must show Crimea as indisputably Russian, as opposed to being subject to a dispute, which is what every reasonable observer agrees on — including Putin’s envoy to the UN Security Council, merely by showing up? The propaganda or agitation instigating social, racial, national or religious hatred and strife shall not be allowed. The propaganda of social, racial, national, religious or linguistic supremacy shall be banned. […] The list of data comprising state secrets shall be determined by a federal law. It would admittedly be a stretch to argue that disputed areas are a state secret. But in the strange new world of Putin’s Russia, I can almost fathom somebody arguing that showing the “wrong” borders instigates national hatred to the extent that it amounts to a call for “unsanctioned protest”. And apparently, that is exactly what one Russian Deputy intends to do. Google has clearly decided not to test whether this bizarre interpretation of a bizarre law would stand in court. I suspect Google might even win were it to stand its ground. Instead, I think the real reason why Russian Google Maps shows Crimea as undisputedly Russian is that the annexation is popular inside Russia. Showing Crimea as disputed territory would likely lead to calls for boycotts of Google’s services in Russia. 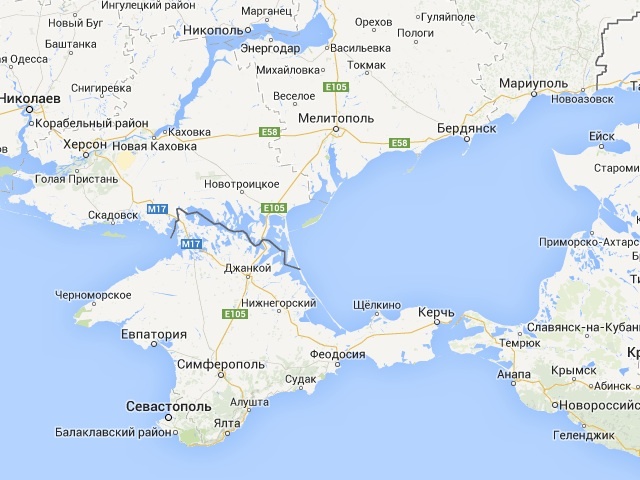 Quite possibly, local Googlers also feel it is just and right for Google Maps to show Crimea as undisputedly Russian. More charitably, Google HQ might fear for the safety of its local employees. But these are not the reasons Google has given for its caving in to Russia’s increasingly dogmatic world view. Perhaps Sergei Brin, whose early experiences of persecution in Russia ultimately led him to take the moral high ground in China and pull the plug on Google.cn in 2010, has yet to tackle this issue. And then there is Ukraine: Another major hint that these maps were tampered with not due to legal coercion but in order to protect Google’s existing business in an environment of charged nationalism is the fact that the Ukrainian Google Maps also differs from the international version. To the best of my knowledge (and no little Googling), Ukraine also has no law constraining the depiction of its borders on maps. And yet in Ukraine too, Google’s map aligns with the prevailing popular sentiment. Google should take a stand for accuracy in every situation it is not compelled to do otherwise. Acknowledging that Crimea is disputed territory must not be made tantamount to taking sides in this conflict. Surely the Ukrainians and Russians can agree that they fundamentally disagree on who should own Crimea. That truth should be reflected on the map. 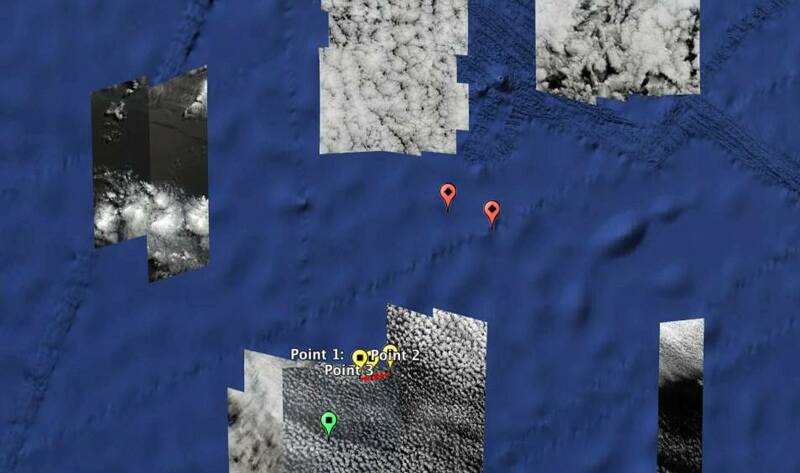 MH370: Google adds satellite search imagery to Google Earth; black box heard? Two new pieces of information today relevant to the ongoing search for Malaysian Airlines MH370: There is a potential location for the black box, and Google Earth now shows recent satellite imagery of the search area in its default layer. 1. Black box heard? A Chinese patrol ship has picked up pings that match those of a black box, both on Friday and again on Saturday, according to China’s CCTV. 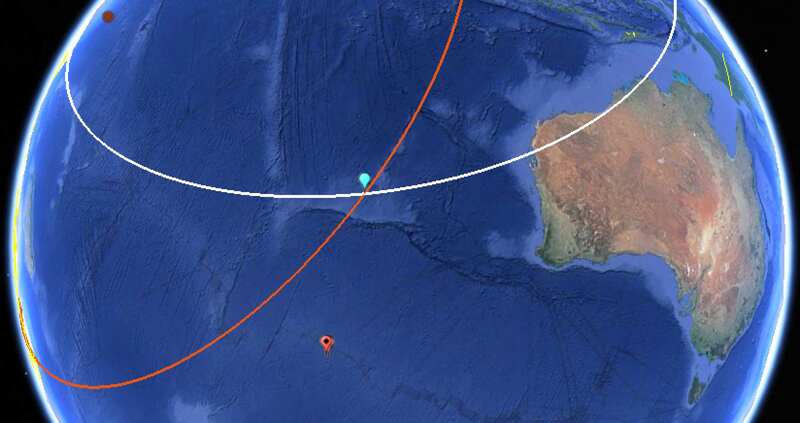 The approximate location is 25°S, 101°E, which is further north than where the bulk of search efforts have been expended so far, but uncannily close to the circumference of the original “ping arc” generated from the Inmarsat-3 F1 satellite, which shows a possible range of locations for MH370 when it last made contact on an hourly basis. I’ve now added that rough location to existing data for past searches, and appended the original ping arc and projected reach of MH370. Here is the resulting file, to download and open in Google Earth. 2. Search imagery added: Starting up Google Earth today, I was surprised to find the region of the search displaying very recent satellite imagery, taken taken between March 18 and 31, 2014 as part of the search for MH370. The dates are displayed in the status bar at the bottom of the app, and the imagery is credited to CNES/Astrium, which manages the SPOT satellite program. I don’t know how long this imagery has been there, but since there hasn’t (yet) been an announcement on Google Lat Long blog, I’m assuming this is a quite recent addition. To see the imagery at its best, turn off the water surface layer. The images are quite contrasty, so you may want to turn up the brightness of your screen. One thing to keep in mind: The search locations far to the south may still be relevant for finding floating debris, even if the bulk of the wreck has sunk much further north, due to prevailing currents. MH370: Amateur hour at the Malaysian Remote Sensing Agency? 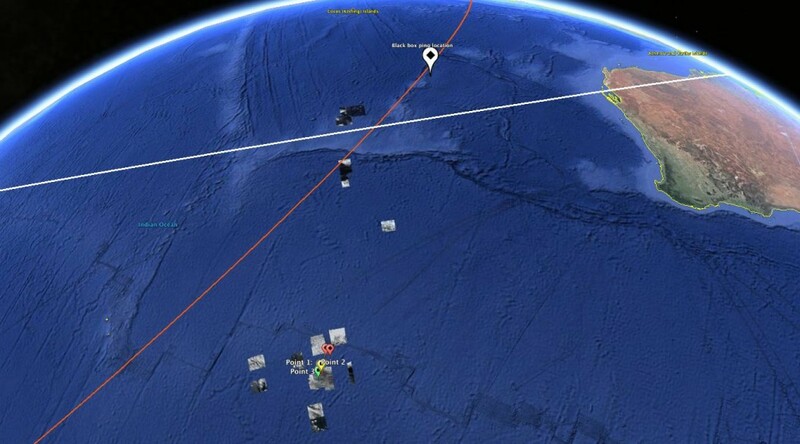 The Malaysian Remote Sensing Agency (MRSA) today released an annotated satellite image purporting to show a debris field in the Southern Indian Ocean, near the area where the plane is believed to have perished. Unfortunately, using only the information contained by the image, it can easily be proven to be self-contradicory, and hence useless. I’ve been collecting satellite imagery of possible debris sightings in a Google Earth file as they are shared with the press, using the coordinates displayed on the image to georeference them as accurately as possible. 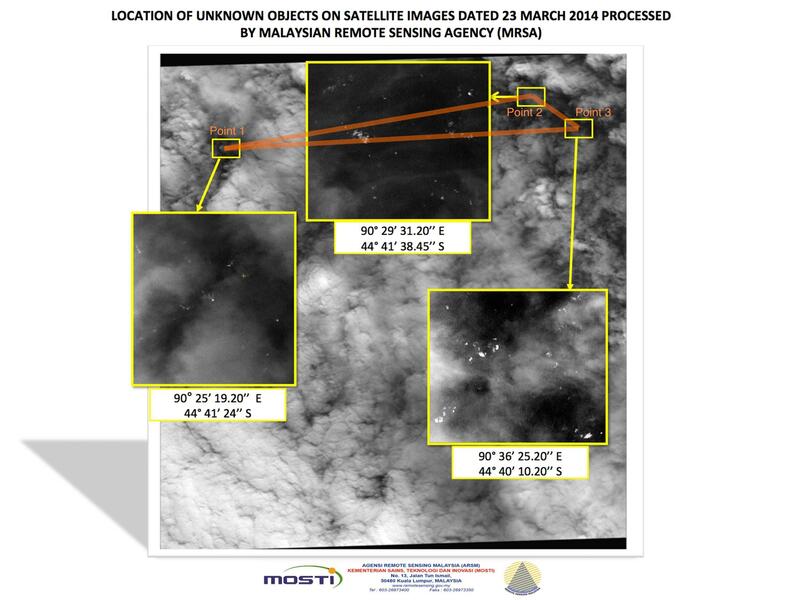 The image released today by Malaysia superimposes three areas in high-resolution from breaks in the cloud in a mostly cloudy image, accompanied by their coordinates. On the image, these three areas form a long and narrow obtuse triangle (which I’ve highlighted in orange). When I plotted their associated coordinates on Google Earth, it quickly became clear that they do not at all correspond to the same shape. The triangle on Google Earth is completely different. A subsequent quick casual inspection of the coordinates in the image shows their arrangement to be geographically impossible. Here is the view in Google Earth of the same points, their coordinates accurately georeferenced. With their placement known to be wrong, I took a closer look at the high-resolution areas in the image and compared them to their adjacent smaller counterparts. The do not in fact seem to be related. The cloud layers bear no similarity. This image is either a fabrication — a piece of fiction cynically concocted to feed the journalists and families of the victims — or it is an honest mistake by somebody who perhaps should step aside for the greater good of this recovery mission. 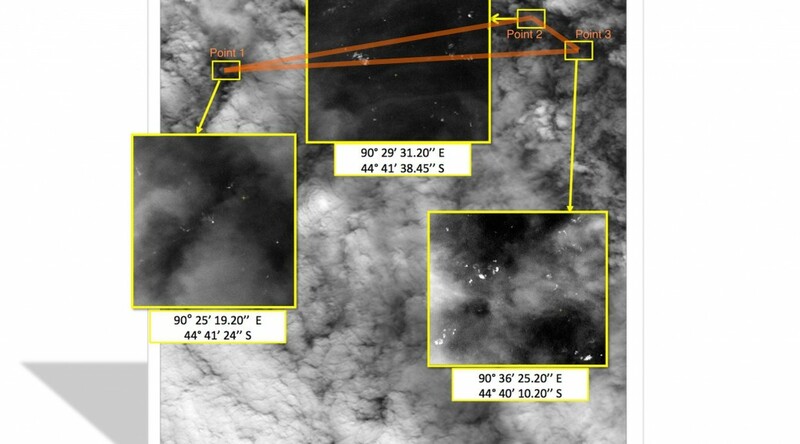 UPDATE March 22: Keith Ledgerwood, who devised the theory that MH370 may have shadowed another plane, argues (convincingly) that the track shown to the media and families in the photo below is not of MH370 but of either UAE343 or SIA68, both of which were in the area at the time. If this is true (which it appears to be), then it is an astonishing piece of misdirection by the Malaysian military representative to the families of the victims and the press. The following post now needs to be treated as possibly based on misinformation, alas. 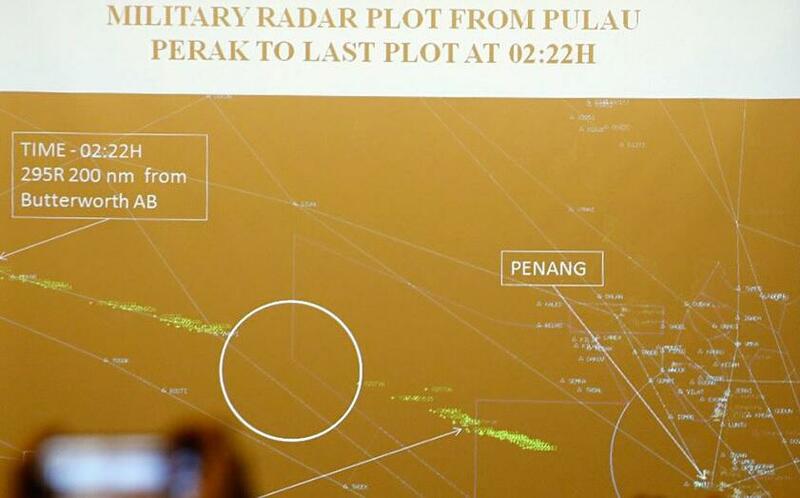 UPDATE March 23: The New York Times, however, still treats the plot in the image below as coming from MH370. So at the very least, there are two conflicting official accounts of the path MH370 took. To analyse the image properly, I took a screenshot of the same area from SkyVector‘s amazing aeronautical charts, overlaid and aligned that SkyVector screenshot onto Google Earth, then overlaid and aligned the photo of the radar image onto the SkyVector screenshot, then annotated the SkyVector screenshot as precisely as possible, in order to position the last known plot accurately in Google Earth. One thing that aligning the photo with the SkyVector screenshot lets us do is notice that the green “line” and the annotation arrow extends slightly beyond MEKAR. If so, MH370 was on its way to NILAM — where its path would have crossed route P627, which skirts past the northern edge of Sumatra and into the Indian Ocean in a WSW direction. 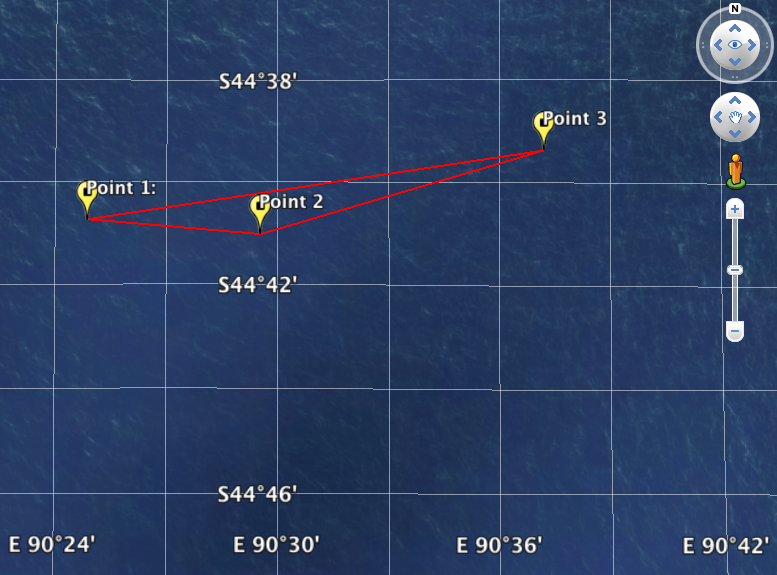 The last known bearing of MH370 is thus far less suggestive of a northerly route. If we now connect the dots, from the position at 01:02 MYT as plotted by FlightAware, to IGARI, to VAMPI and then on to just past MEKAR at 02:22 MYT, we get a distance of roughly 1090km (see the KMZ file to check), flown in 80 minutes. That’s a speed of 820km/h, approximately, which is feasible. What about that circle annotation in the photograph and the green “line” to the right? Absent an official account from the press conference, here’s my take: The circle is meant to highlight empty space, and thus show that the two green lines are two separate tracks from 2 separate planes. That would also explain the second arrow annotation on the right, which presumably leads to a label for another plane. Note too that these two green “lines” have slightly different bearings. But if anyone has an official clarification, I would love to hear it. UPDATE: Keith Ledgerwood was able to convince me, with images not in the public domain, that the second arrow notation referred to the same track. So there are no two planes. UPDATE March 22 22:37 UTC: I’ve found the original image on a Chinese media website. I’ve edited the post above to reflect this. Unfortunately, the caption doesn’t provide much in additional context. Here it is via Google Translate. Over the weekend, several initiatives mapped airports that could serve as potential landing spots for missing Malaysian Airlines flight MH370. 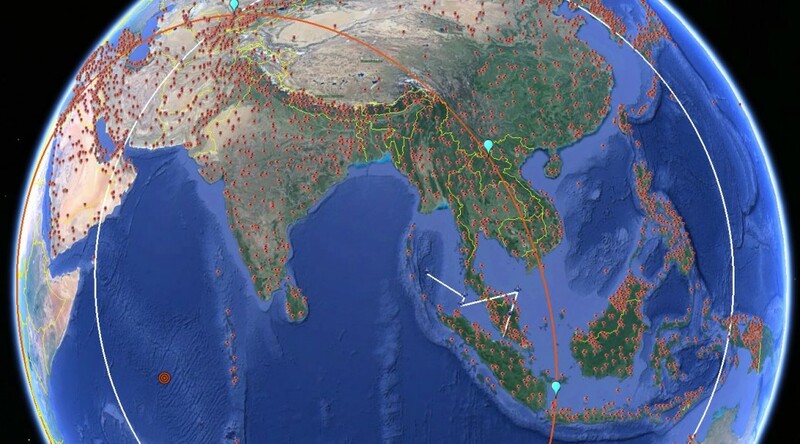 WNYC first mapped large airports within MH370’s flight range onto Google Maps; then David Strip used data from OurAirports to cast a wider net of potential landing spots and put that in Google Maps. That’s a good idea, but Google Earth is perhaps the more versatile tool for doing some proper research, especially as it has historical data with which to compare new satellite data as it arrives. What does this file contain? All Asian airports, minus Russian airports, plus Western Australian airports. I’ve taken out seaplane bases and heliports, but left in closed airports. I cleaned up the data for two Western Australian airports with faulty coordinates. Why keep small and closed airports? Because in a search, this file should essentially be used to rule out potential airports. If MH370 landed somewhere (as opposed to crashing) then that airport will most likely turn out not to be on this list, or else be a small or closed airport that has recently undergone expansion. (However: Keep in mind when scouring Google Earth that satellite data may be a few years old). I used Google Outreach’s Spreadsheet Mapper to convert the orignal data to KML. At just over 3500 data points, I was definitely pushing the limits of that technology. Here is the spreadsheet I used for this KML file. The disappearance of Malaysian Airlines flight MH370 has had me glued to the Internet. Now over a week into the mystery, more specific data has begun to emerge regarding MH370’s apparent flight path and possible last locations, from two distinct sources. I felt I could contribute by adding these as accurately as possible to Google Earth, for others to use. Here’s the resulting KMZ file for Google Earth. Read on for the context. 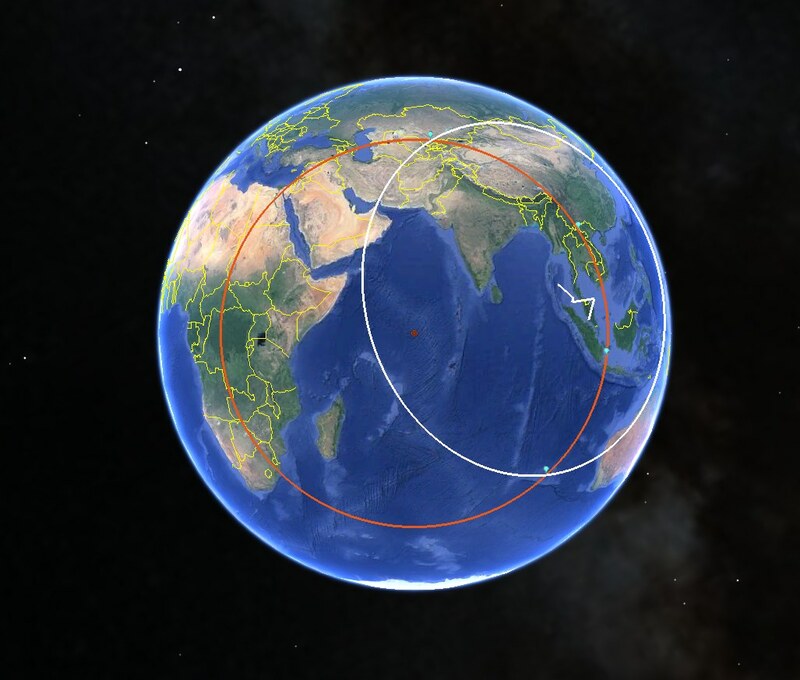 Using this KML circle generator, I then recreated the circle from the diagram (in orange in Google Earth), which turns out to have a radius of 4,750km. I also added the points demarcating the start and end of the two arc lengths, as depicted on the diagram. 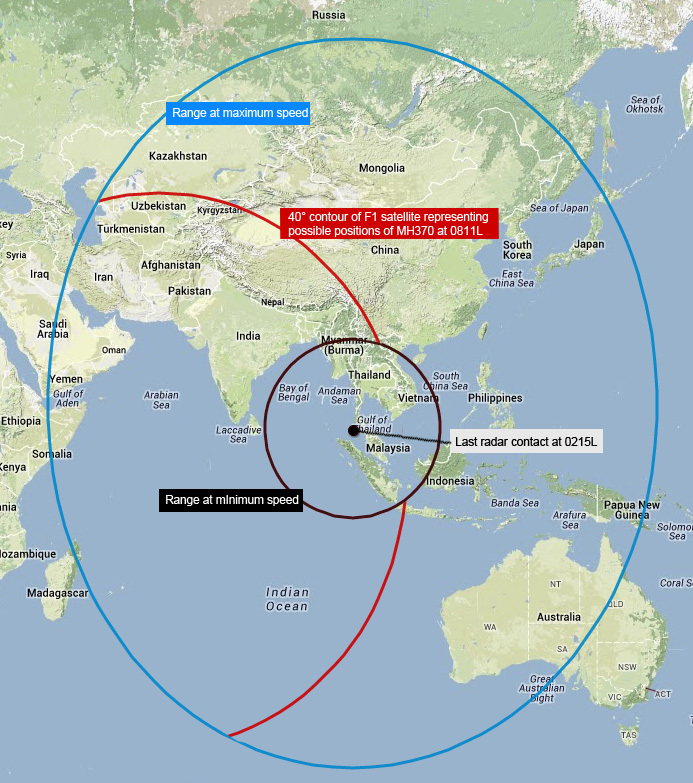 On March 14, sources described to Reuters the details of Malaysian military radar data, which saw MH370 follow specific waypoints as it veered across the Malaysian peninsula and then set course for the Andaman and Nicobar Islands, before going out of radar range. I then converted these to decimal degrees before adding them to Google Earth. 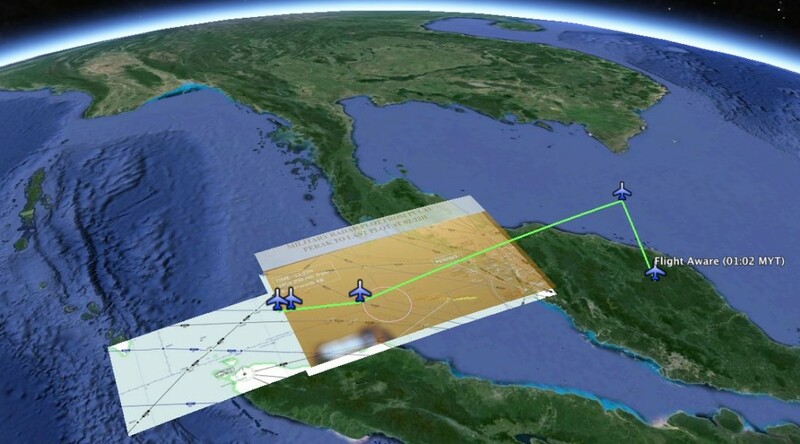 To these coordinates, we can of course add the coordinates of KUL, Kuala Lumpur International Airport (N2.73° E101.71°) and also the last recorded position of MH370 on Flight Aware, a public flight tracking service, which placed the plane almost exactly half-way between KUL and IGARI. These six points together allow us to reconstruct the flight path for the first two hours or so, depicted as a path in Google Earth. Finally, I’ve added a second circle (in white on Google Earth): This circle has the IGREX waypoint as its center, and it bisect the two furthest points on the two Inmarsat arcs depicted in the diagram. That circle’s radius turns out to be 4,400km. 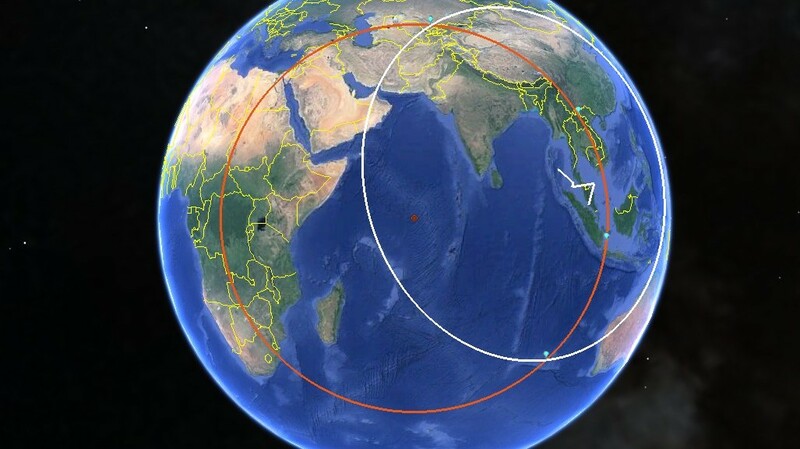 Given the cruising speed of a Boeing 777-200 at 905km/h, that circle depicts the distance MH370 would have flown in just under 5 hours from there (assuming a straight line). As new information becomes available, I will try to update this post as well as the KML file. 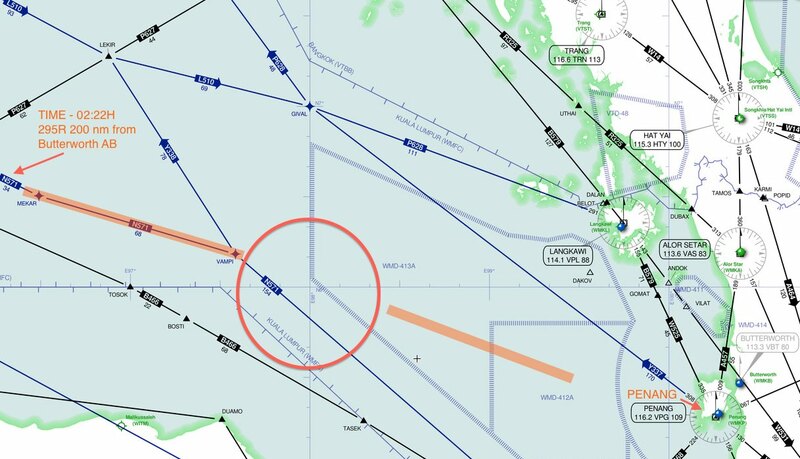 UPDATE March 17, 17:45 UTC: As per this blog post on TMF associates, the interruption in the arc near the Gulf of Thailand is due to the Malaysian government’s own calculations that MH370 flying at its slowest possible speed in a straight line would not be in this region. 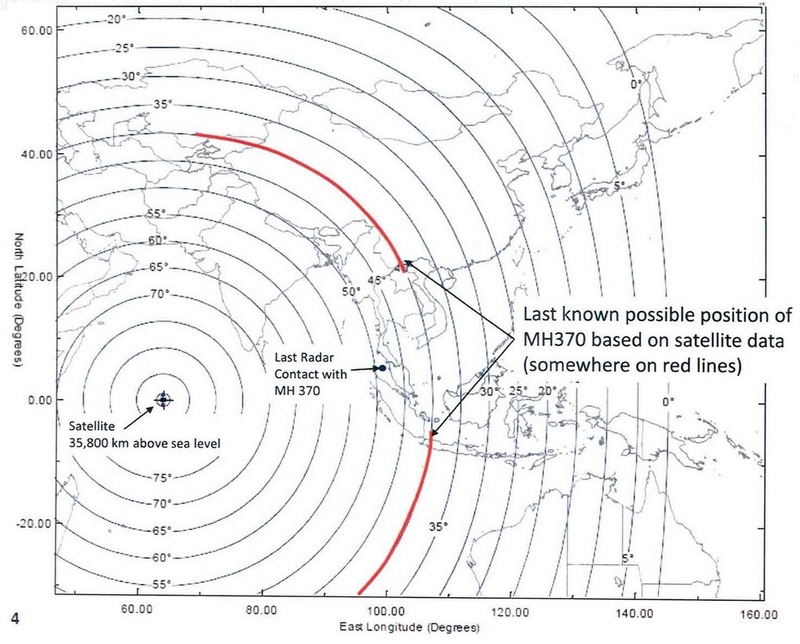 This, however, assumes that MH370 would henceforth fly in a straight line, which it obviously had not been doing. So in practice, the entire orange ping arc inside the white range circle is a valid search location. (It had previously been mooted that the interruption in the arcs was because another Inmarsat satellite would have picked up MH370’s ping had the plane been that far east. But in fact the interruption is not centered on the equator, as it would have had to be had it been due to a bisection from another geostationary satellite). 1. Welcome to the WebGL wars: Google is using this project to promote Chrome’s superior support of WebGL, a web standard for 3D visualizations in the browser. But whereas all the main desktop browsers today support WebGL to some extent, the real differentiation occurs on mobile devices: Android’s Chrome browser supports WebGL whereas iOS browsers do not. Although iPhones are technically capable of running WebGL, Apple has chosen not to deploy the technology. I’ve long wondered why: Perhaps Apple is afraid that if robust 3D tools for the mobile browser become a standard, developers will have less of a motivation to build iPhone apps, which bolster the App store’s competitive advantage. A more generous explanation would be that Apple has simply been waiting for enough newish WebGL-capable iPhones to be in use before switching on the technology for everyone. In any case, we at Söderhavet would love to have WebGL become a ubiquitous standard on mobile devices; we have pitches waiting for clients as soon as the technology works on both major smartphone platforms. 2. Déjà vu: Google has been here before. Back in 2006, it acquired SketchUp, a 3D modeling application, made it free, and added tools to build and deploy buildings in Google Earth. This was part of Google’s strategy to populate its maps with realistic models of the built environment — by having an army of volunteers make them. The result was a enthusiastic community of builders, though it never achieved a critical mass of users. Soon, a far more scalable way of digitizing the built environment emerged, with low-flying airplanes simply making 3D scans of cities. In 2012 Google sold Sketchup and the Google 3D Warehouse to Trimble. 3. Vectors vs blocks: One reason SketchUp didn’t achieve a critical mass of adoption is that while it was far easier to use than other modeling tools, it still had a relatively steep learning curve. In this way it resembles Second Life, which also provides vector-based tools for building in 3D. Minecraft first cracked the code for mass adoption: Abandon vector-based building in favor of discrete block-based construction — it doesn’t provide the same level of realism, but it is much easier to use, and that turns out to be a far more important prerequisite for widespread adoption. 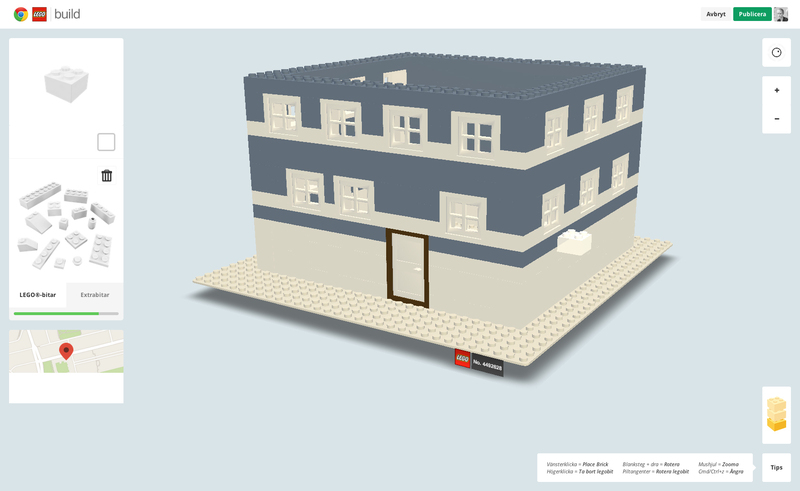 The analogy is obvious: What Second Life is to Minecraft, Sketchup + Google Earth is to Lego + Google Maps. The result won’t be nearly as realistic, but it could become wildly popular. 4. User-generated content on a map spells trouble: There are plenty of examples of how user-generated content on Google Maps and Google Earth has led to strife, because the implied authority of Google’s maps attracts scrutiny. In a fundamental sense, space on a map is scarce, even on a digital map, and especially if users get to build on a first-come-first-served basis, as is the case with the Google-Lego collaboration. Some cautionary tales from the past few years: In Israel, activists mapped old Palestinian villages onto Google Earth, leading to a lawsuit. In Tunisia, activists georeferenced anti-regime videos onto the presidential palace. In Syria, activists used the Google’s Mapmaker tool to denounce the Assad regime by changing street names. Territorial disputes can lead to an arms race of squabbling place names in the Google Earth Community, which stores user-generated content — this was case for the Falklands/Malvinas. 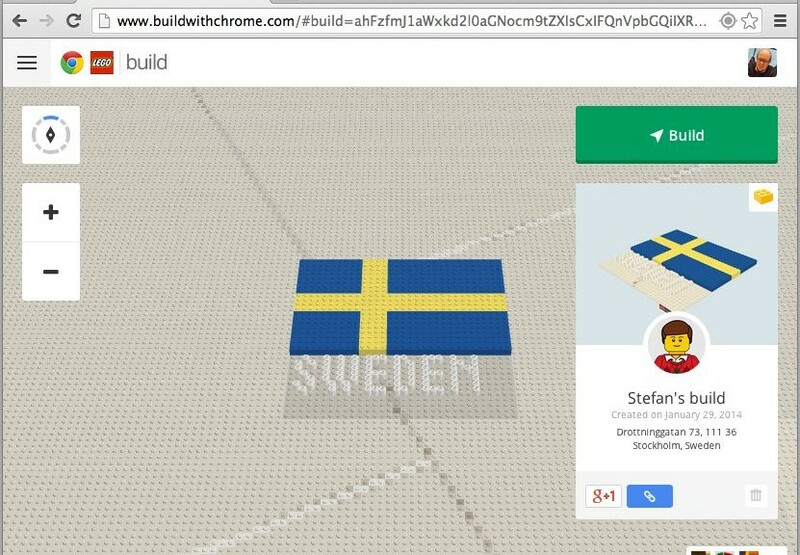 Google’s House Rules for its Lego-Maps try to steer users away from “Lego hacking”, prohibiting the expression of advertising, sexual content, religious and political ideologies or harassment. But humans are political animals, and while a rainbow flag is innocuous to some, it is offensive to others — especially if it were placed in Sochi during the Olympics. In all these cases, not taking a stance is also a stance. Activists know this, and will decide to test these limits to the max. 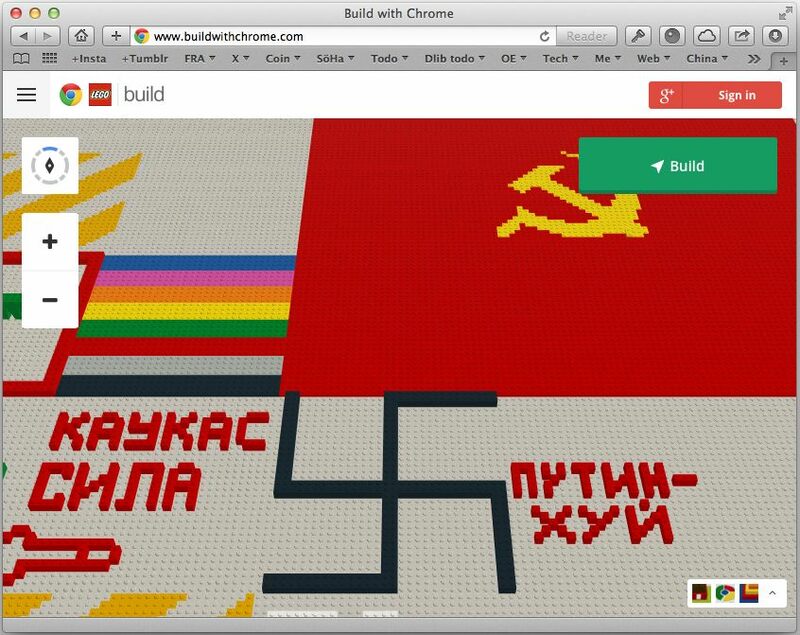 Google will have its work cut out for it, especially if Lego-Maps proves to be an enduring success.